So many of us want to workout but can’t seem to find the time or simply just hate the thought of entering a gym. However, effective workouts can easily be done at your home in a short amount of time. Here is an easy way to get your workout in. Simply pick 3 exercises – one that targets your upper body, one that targets your lower body, and then one that gets your heart pumping. Put a timer on for 3 minutes. You will continue to do each exercise 10 times for the whole 3 minutes. See how many times you can get all three exercises in during the 3 minutes. Take a 1 minute break and do that series all over again for another 3 minutes. Again, take a 1 minute break and do it all again for your last 3 minutes. By the end of your 3 sets, you should be huffing an puffing. Find another 10 minutes in your day, when you can do this again – using the same exercises or change it up. Example of a dip. A chair or table works just fine. 10 Dips: find a chair and put your back to the seat of the chair. Place your hands on the edge of the chair, fingers forward, making sure your back side is close to the chair. Bend your elbows backwards and lower your body to where your elbows are 90 degrees then press them straight. To make this exercise easier work your feet in, to make it harder lengthen your legs out straight. 10 Squats: stand with your feet hip-width apart. Bend your legs and sit back, making sure your knees are not in front of your toes. To make this harder, add a small jump in-between each one. To make this easier, only go half way down. See example above. 10 Jumping Jacks: You can always modify these by stepping side to side or explode into a jump to make it harder. 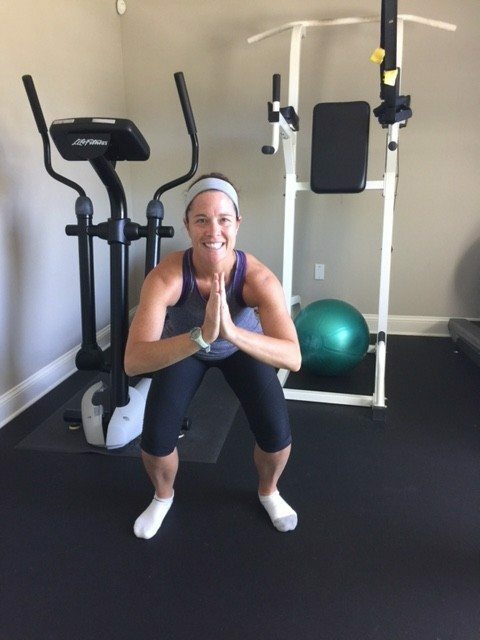 About the author: Molly James is a certified group fitness instructor and trainer who works at the Ponte Vedra Inn & Club, The Lodge, PV Fitness, Bailey’s Powerhouse Gym, and out of her home. If you are interested in small group sessions or one on one classes, you can contact her at m.mollyjames@comcast.net.